By using generator manufacturers’ performance data. The transient reactance (X'd) is used to describe generator performance during transient events such as large load applications. reactances provide an agreed standard and consistent way to compare one generator to another, regardless of the manufacturer. The equation above can be used to show that for a given machine rating (same kVA, same voltage, same frequency), the lower the X'd, the lower the amount of voltage dip for an applied load. 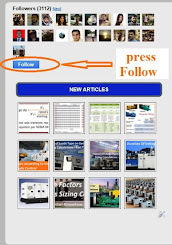 This is based on physics and holds true for all generator set manufacturers. Many manufacturers’ software programs calculate the voltage dip easily. The maximum allowable voltage dip is 30%. Choosing lower allowable voltage dip requires a larger generator set. As you reduce the maximum allowable frequency dip, you increase the size of the generator set needed. To reduce the dip, reduced voltage starters can be used. Engine transient response will add to this dip, but the engine response is usually much slower than the generator. This assumes a very low starting power factor. 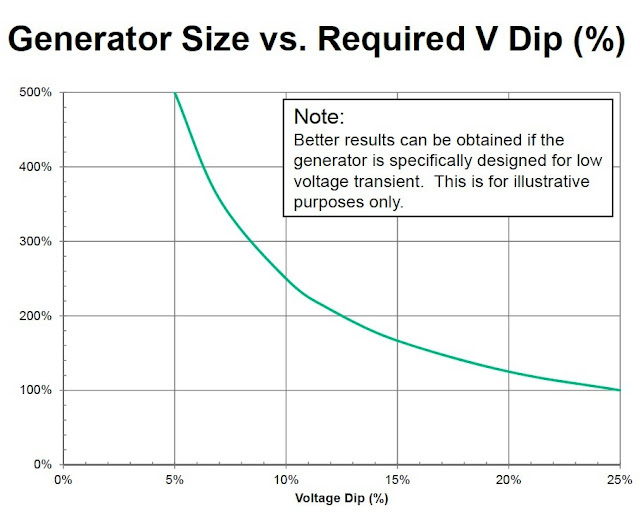 You must increase the value of the generator effective load used in the calculation of the voltage dip. 2000 kW @ 0.8 PF with X’D = 18.2% starts a 750 HP code F motor – What is the approximate voltage dip? Then the size of the selected generator is suitable for the application. For more information about Transient Voltage Dip, please review our article” Generators Sizing Calculations – Part Six”. Where the temperature of the ventilating air to the generator exceeds 40°C (104°F), derating of the generator may be necessary. An engine’s power rating assumes a nominal altitude of less than 1000 feet, ambient temperature less than 104°F, and humidity less than 75%. Manufacturers detail the percentage reduction in available power for ambient conditions that exceed those assumed for the nominal rating. 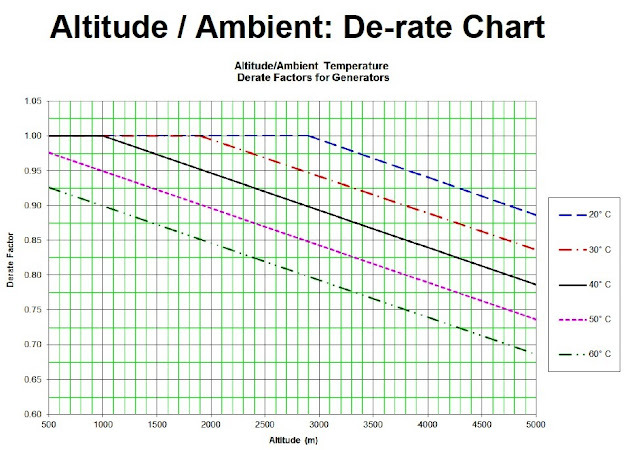 The higher the altitude, the lower the air density. 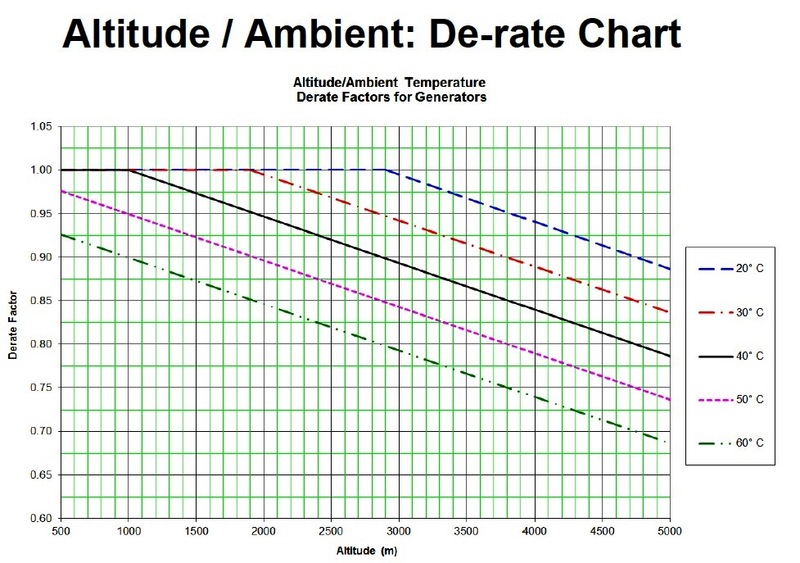 The altitude/temperature derating chart found in TMI can be used for proper derating information for generators and each specific engine. 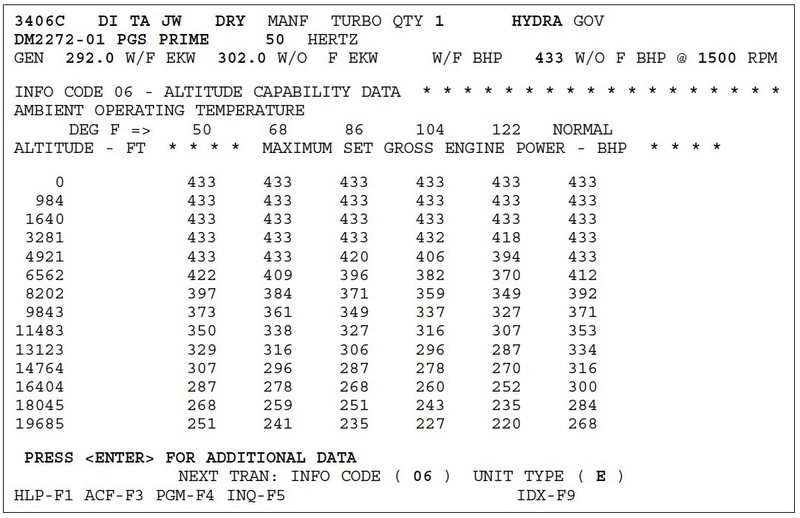 Figure .2 shows a sample engine TMI de-rate chart. 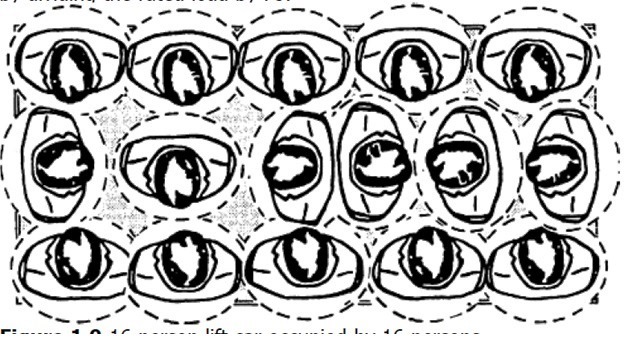 (TMI: Technical Marketing Information). The selection of natural gas, diesel, or LPG fuel will affect generator set availability and sizing. 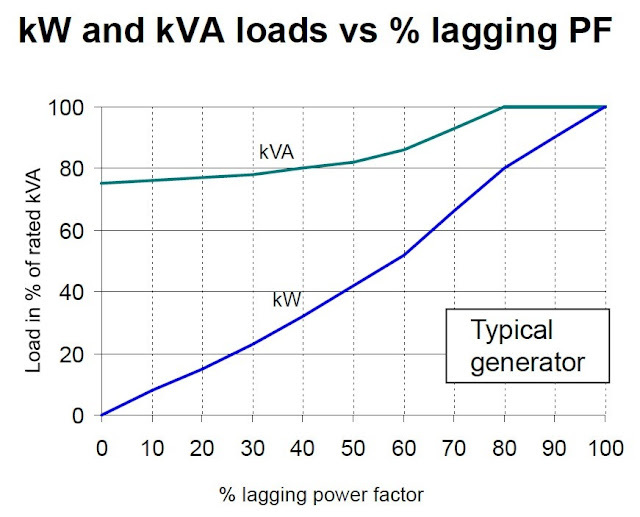 Often, generator sets running on gas or LP must be oversized due to de-rating. Gasoline, diesel, or liquid propane generators usually should be de-rated by 2–3% of its standard output. Natural gas generators, the de-rating factor is typically closer to 5% of its standard output. For more information about Site Conditions & Fuel Type selection, please review our article” Generators Sizing Calculations – Part Four”. Leaving room for another generator to be installed at a later date. However, the projected load growth for any application should never be less than 10%. Table-1 shows typical load growth over a period of 10 years for various applications. Lower PFs require larger alternators or generator sets to properly serve the load. Usually Three-phase generator sets are rated for 0.8 PF loads and single-phase generator sets for 1.0 PF loads. For example, the following data in Table-2 for the Siemens AG type 1FC6 generators typify the de-rating factors for power factor that need to be applied. For more information about Power Factor de-rating rule, please review our article “Generators Sizing Calculations – Part Seven”. Based on this KW G-effective, we can make a preliminary selection of the generator. After that, Site Conditions de-rating factors, Fuel Type de-rating factor, Future Needs factor and Power Factor de-rating have to be applied as explained in steps# 8, 9, 10 & 11 respectively. We can use the different Manufacturers Catalogs to assign the proper generator standard rating that will be next higher to KW G-adjusted calculated above. 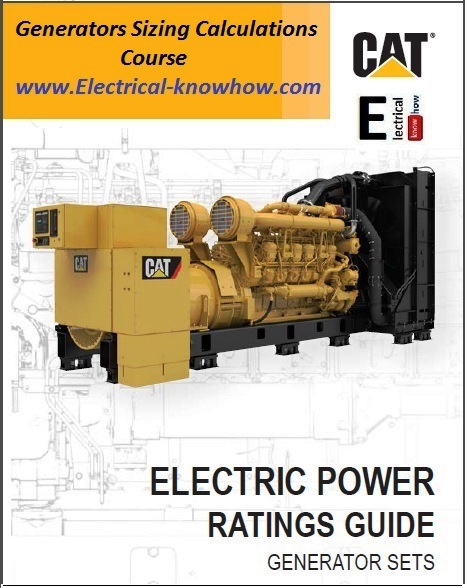 Caterpillar Generators Rating Guide 2017. Cummins Generators Rating Guide 2017. Otherwise, you will need to move to the next higher size till you comply with the above two rules. The Brake Mean Effective Pressure (BMEP) charts are used for load step analysis and for developing a starting sequence of a generator. 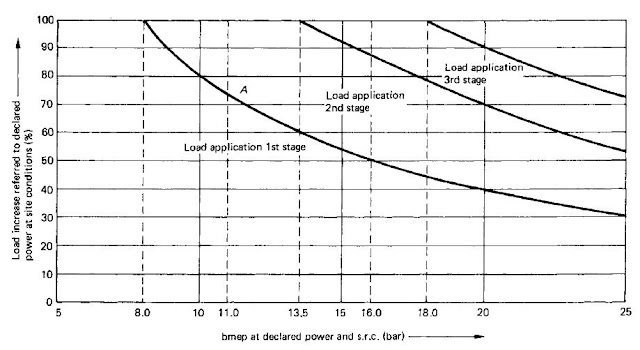 For example, Using Figure.1, the number of load steps needed for desired power can be determined. First, find the BMEP of the engine at rated speed; BMEP levels are shown for each rating in the performance data of the TMI (Technical Marketing Information). Case#2: If the percentage of the block load is greater than the first load step curve but smaller than the second load step curve, it will take two load steps to reach desired power. Case#3: If the percentage of block load is greater than the first two load step curves but less than the third load step curve, it will take three load steps to reach desired power. 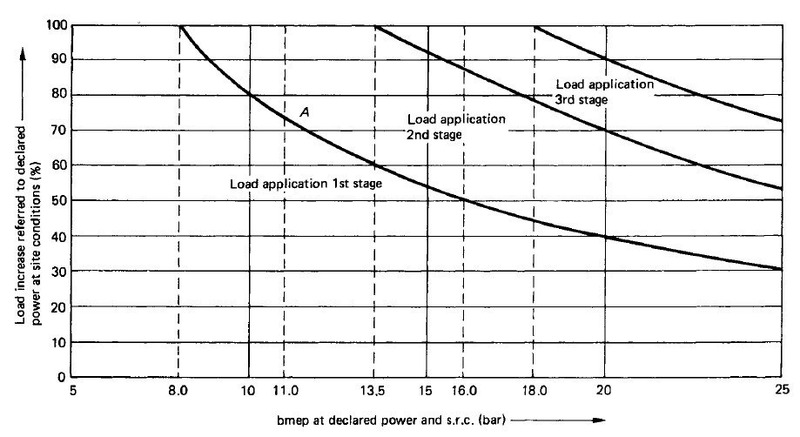 For more information about The Brake Mean Effective Pressure (BMEP), please review our article “Generators Sizing Calculations – Part Nine”. In the next article, we will explain the rules of thumbs and solved examples for Generators Sizing Calculations. So, please keep following. Step#6- Existing Installations: Check for transients or harmonics by using power analyzers and de-rate the peak load value.